Lithuanian State Department of Tourism presents the new touristic brand in Lithuania, focused on the concept: “Lithuania. Real is beautiful” that wants to be an advice to travellers from around the world to visit and discover a destination rich of unique and unexpected places. “We are delighted to launch the first touristic brand in Lithuania, thanks to which we will present to the world the peculiarities of our destination. The new brand image reflects the cultural heritage and the natural heritage of Lithuania, and invites tourists from all over the world to visit us and holds the promise of unforgettable travel experience” says Jurgita Kazlauskienė, Director of the Lithuanian State Department of Tourism . 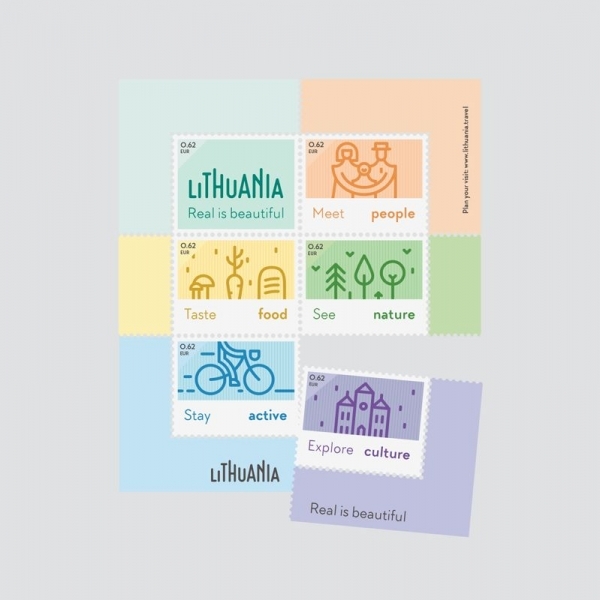 The new logo of the Lithuanian tourism is inspired in shape and colour – mint green pastel – to a stamp, which frames the tourism slogan “Lithuania. Real is beautiful “. Font is dynamic and lively and draws the branches of trees and nature, the protagonist of the Lithuanian landscape. In the various communication tools and marketing, the main logo will be accompanied with complementary thematic brands, each associated with one of the features of tourism in Lithuania: “Meet people”, “Taste Food”, “Stay Active”, “See Nature,” Explore cultures “. The concept of the new brand of the Lithuanian tourism has been developed in collaboration with the advertising agency “New!”. “It is not easy to encourage tourists to visit a small country in Northern Europe still little known, so it is even more important to a brand image with a strong communicative impact. Lithuania is a place where the natural and authentic things are of great value: the food, nature, architecture, culture, hospitality. Not ideal and perfect, but we are proud of our imperfections, because we make it real. In short, we see the beauty in things genuine. This is the face of the new tourism communication: sincere and without tricks. Our slogan contains a promise: if you want to get away from fake smiles, concrete jungles, plastic architectures, Lithuania is the perfect choice.” says Tomas Ramanauskas, creative director Lithuanian advertising agency” New! “.